How it works: Ants enter the home in search of water and are most often found near water sources (i.e. : kitchen and bathroom). This is because an ant can live for a long time without food, but cannot survive even one day without water. 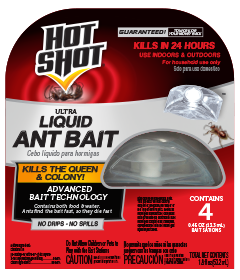 This bait is extremely attractive to ants because it combines a food source with the water source they need, while delivering a lethal dose that can quickly eliminate the entire colony. Kills common household ants. This product will not control carpenter, pharaoh, harvester or red imported fire ants. Place bait stations where ants have been seen or in out-of-the-way places near walls in cabinets, under sinks and refrigerators and in closets. Heavily infested areas may require additional bait stations. Examine bait stations once per month to verify that bait is still present in the station. Replace bait stations every three months or sooner if empty bait stations are found. This product will not control carpenter, pharaoh, harvester or red imported fire ants. Place one bait station along each ant trail around the outside of homes. Place stations in areas inaccessible to children, pets and other nontarget animals. Heavily infested areas may require additional bait stations. Do not apply directly to water. Drift and runoff may be hazardous to aquatic organisms in water adjacent to treated areas.